You are here: Home / Bathrooms / The Most Dangerous Room in the House…Your Bathroom! The Most Dangerous Room in the House…Your Bathroom! Did you know that slips and falls are the leading causes of injury and death for people over the age of 65? And over 33% of these seniors fall each year! While an accidental fall can happen anywhere, many falls happen because of slippery surfaces encountered while getting in and out of the bath. A momentary loss of balance or mobility can lead to a life changing event. The bathroom can clearly be the most dangerous room in the house! A University of Michigan study confirmed that nearly a third of people over the age of 60 experience difficulty maneuvering in and out of a bathtub. What can be done to make a bathroom safer, especially for a senior who values independent living in his own home? Fortunately, there’s an easy solution…and it’s called the Easy Step! 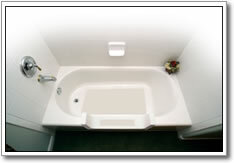 In less than a day, an existing conventional bathtub can be converted to a walk-in shower. The process involves cutting down the side of a tub and inserting a special step. When combined with the installation of grab bars, curved shower rods, hand-held shower heads, and slip-resistant surfaces, the Easy Step dramatically improves the safety and convenience of showering. 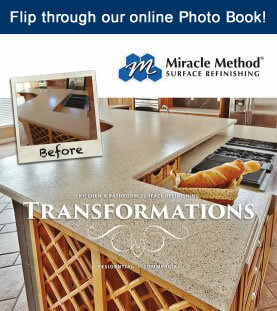 Miracle Method offers an affordable alternative that improves bathroom safety without requiring total reconstruction. For more information, please contact Miracle Method at 1-888-444-8827 or visit our website at www.miraclemethod.com.